In a handful of recent decisions, the U.S. Supreme Court has affirmed the right of businesses to effectively break the law by putting a few carefully worded sentences into their contracts and user agreements. 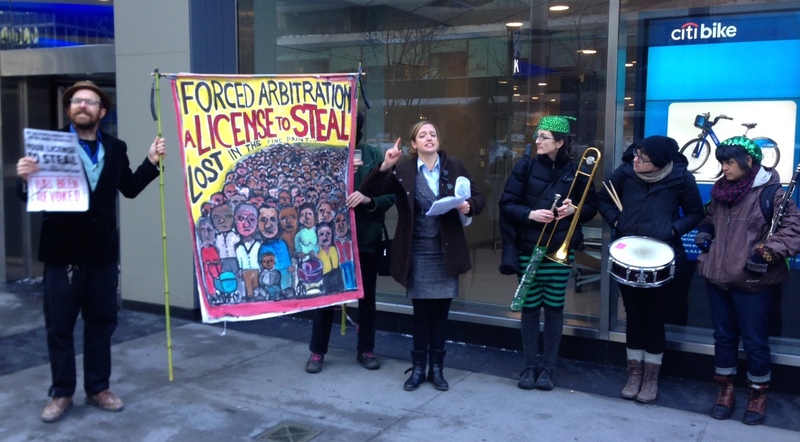 But just because you can add these clauses doesn’t mean you have to do so, which is why pro-consumer advocacy groups gathered more than 100,000 signatures on a petition that was delivered, with a little bit of music, to Citigroup HQ in Manhattan this morning. The petition asks Citi and many of the nation’s other largest banks — JPMorgan Chase, Wells Fargo, US Bancorp, and PNC Financial — to do away with anti-consumer forced arbitration clauses in their customer agreements. These clauses take away a customer’s legal right to file a complaint against the bank in court and diverts all legal matters to a binding arbitration process that even its supporters admit is unbalanced in favor of the companies involved. Additionally, many arbitration clauses include a ban on customers combining their complaints into a class, meaning each dispute must go through arbitration on its own. Since arbitration damages are limited, the cost of mounting a case against a multibillion-dollar company can be much more than any possible financial redress. That same year, the federal Consumer Financial Protection Bureau released a report on arbitration clauses in credit cards and other financial products, which found that larger banks were more likely to compel customers to use arbitration, that smaller banks were less likely to include bans on class actions, and that arbitration clauses are written in a way that makes them more difficult to comprehend than other contract terms. “Many consumers don’t even know that buried in their contracts is a forced arbitration clause that preemptively blocks their right to a day in court,” explains Alexis Goldstein, communications director for Other 98%, one of the groups involved in the petition. But even though banks have done their best to make sure that consumers don’t notice or understand these clauses, the sheer number and variety of people signing the petition gives advocates hope that this issue is finally gaining traction with the American public. “The broad response that the petition has received around the country shows a strong consumer demand for an end to this rigged game designed by Wall Street,” said Christine Hines, consumer and civil justice counsel for Public Citizen’s Congress Watch division.